Although zucchinis are pretty much found year-round for the most, zucchini peak season is fast-approaching. Naturally, it makes sense to incorporate zucchini into the long list of recipes we intend to make. 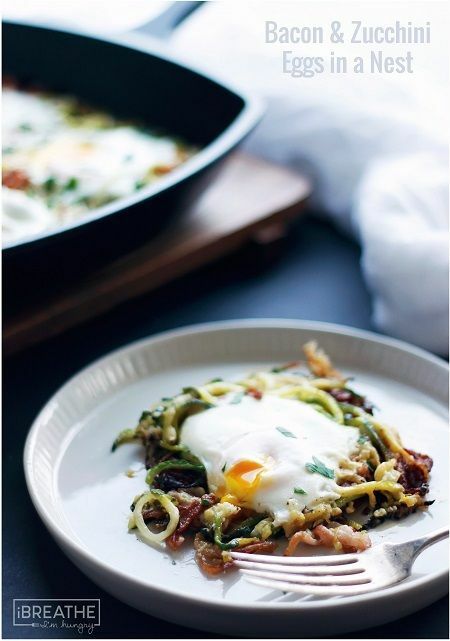 Plus, this zucchini egg nests recipe also gives you another opportunity to break out your beloved spiralizer. Hooray! And obviously, who doesn’t love edible egg nests?! First of all, cut your bacon slices in half, then cut them lengthwise into ¼ inch thick strips. Then, in a heavy saute pan, cook the bacon for about 3 minutes. After that, add the zucchini and mix well. Then season with salt and pepper and flatten slightly, creating four depressions for the eggs. Following the seasoning, sprinkle with the Asiago cheese. Now break one egg into each dent. Finally, cook on medium-high heat for about 3 minutes, then cover and cook for an additional 2-4 minutes, or until the eggs are cooked to your liking and the bottom is crispy.